An award of $500 is presented in memory of the late Cornelius W. Barton for a graduate student (MA, MS, or PhD) conducting research on any topic pertaining to military history or military archaeology. Mr. Barton served in the Army and had a very keen interest in archeology and history his entire life. His family has donated the money for this grant in his memory with the hope of fostering the same love of history in others. The purpose of the grant is to assist a student in advancing their research project and can be used for any justifiable expense (for example, but not limited to: equipment acquisitions, analysis costs, software purchases, or to help defray the costs of fieldwork). One grant will be awarded annually on a competitive basis and will be administered by the Battlefield Restoration and Archaeological Volunteer Organization (BRAVO). Research proposal, no more than three pages long, that describes the research, its potential contributions to military history or archaeology, and a justification of how the funds will be used. Maps, graphics, etc. may be additionally attached. Two letters of support, including one from the student's advisor that indicates the expected date of completion of the project and that the student is in good standing with the department. A letter is requested at the completion of the project, updating BRAVO on how the money was used to benefit the project. Deadline for nomination: July 1. Please submit all applications electronically in Adobe PDF format to bravodigs@gmail.com. Award Date: The selected recipient will be notified by email. history or military archaeology as a travel stipend for the biennial Fields of Conflict conference. is not restricted to US projects, but will be paid by check in US dollars. 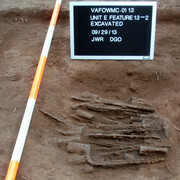 the research and its potential contributions to military history or military archaeology. Maps, graphics, etc. may be additionally attached. applications electronically in Adobe PDF format to bravodigs@gmail.com. BRAVO has offered a variety of public programs in the past. Below is a brief list of past public outreach events. Please contact us if you would like more information. The programs listed below are among those presented at BRAVO meetings to which the public is invited. "Ladies From Hell - Repulse of the British Third Brigade at Monmouth", presented by Dan Sivilich, president of BRAVO. Entertaining and interesting slide presentation on the battle against the 42nd Regiment of Foot (referred to as "ladies" because they wore kilts) as we now know it to have occurred due to archaeological discoveries at Monmouth Battlefield. For information about having this presentation given to your group, click on "Contact Us". "A Billy Yank Governor", presented by author Bernie Olsen. The life and times of Franklin Murphy, New Jersey's turn-of-the-century governor who also fought in the Civil War. His presentation and book of the same name contain information and photographs never before published. "Old Tennent Church Talk and Tour", presented by Reverend Dr. Hugh MacKenzie. Fascinating information about the history of Old Tennent Church in Manalapan, NJ, one of the few original 18th century churches remaining in the state. "Monmouth County's Role in the Civil War", presented by Jim Stephens. An overview of the 1862 Monmouth Regiment and those troops' service in the Civil War. Dr. Paul Kovalski, forensic dentist and president of the Marlboro Township council: slide presentation on the identification of bodies through dental forensics, and how this science has evolved since the time of Paul Revere, who was one of the first to use dental forensics to identify the body of an officer killed at Bunker Hill. "Excavating Architecture", a slide presentation by Dr. Garry Stone. Excellent presentation exposing hidden evidence in the walls, rubble piles, and beneath the surface of old buildings that can help us unravel the secrets of the past. Highlighted were classic New Jersey homes, excavations from St. John's (1638-c.1715) in St. Mary's City, MD, and Wright Tavern (c.1799-present) in Wentworth, North Carolina.